Something I really like is making pesto out of not your typical pesto ingredients. Pesto does not need to have a Basil and Pine Nut base. For Instance, I have a wonderful Spinach and Pecan Pesto I make every now and then. When I found out I was working with Barilla this month and saw some of their recipes, their Charred Green Onion Pesto stood out. An added plus to this recipe is that it called for their Gluten Free pasta that I had finally found in a local grocery store. Alike some other pastas I had tried it was a corn and rice pasta that is GMO free. I have been on the search for a good gluten free pasta and I think I may have found my new go-to pasta. Best part about the pasta is my family wasn’t asking is this gluten free. The pesto was very easy to make and was surprisingly tasty. I love it when recipes comes together like that! You simply roast your green onions in the oven for 10 minutes, then let them cool and once cool you through into the food processor. Add some cashews, parmesan cheese, a couple ice cubes, a tad bit of water and olive oil and pulse a bit more and voila! You have pesto! 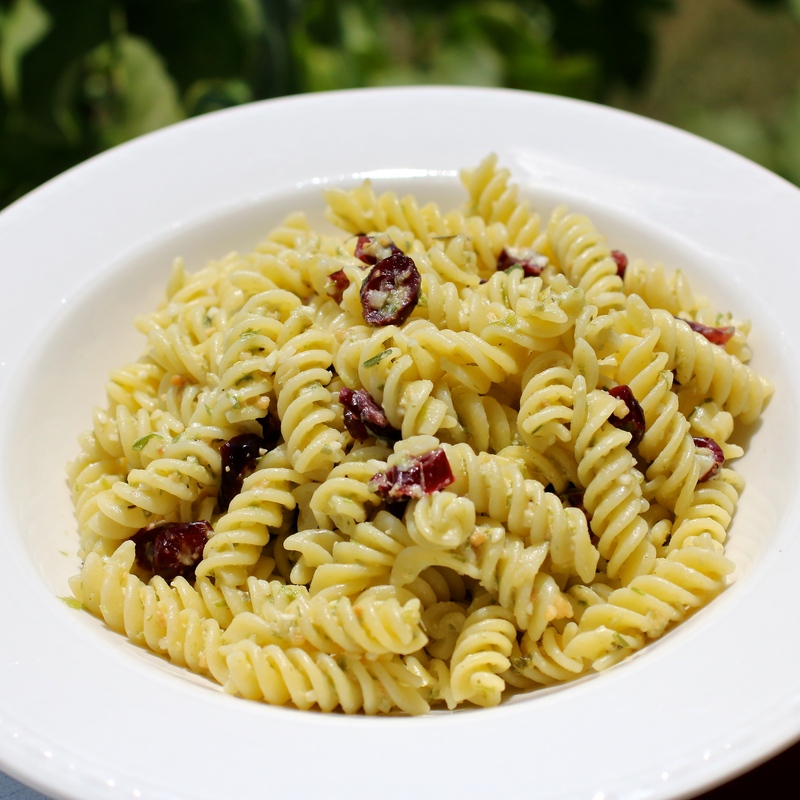 Toss with your rotini and some soaked dried cranberries and you have your pasta dish. It would be great with some grilled chicken breast also. Try it for yourself and let me know what you think! Pre-heat the oven to 425 degrees F and bring a large pot of water to a boil. Place cranberries in bowl of hot water to soak. Toss the green onions with 1 tablespoon of olive oil and season with salt and pepper. Place on a sheet tray and roast in the oven until lightly charred, about 10 minutes. Remove the onions from the oven and let them cool down. In a blender combine the onions, cashews and Parmigiano cheese, pulse for 5 seconds. Slowly drizzle in the remaining olive oil and season with salt and pepper to taste. Add the ice cubes and puree. Remove the pesto from the blender and place in a large bowl. Cook the pasta according to the package directions, drain reserving 1/2 cup cooking liquid. Drain cranberries. 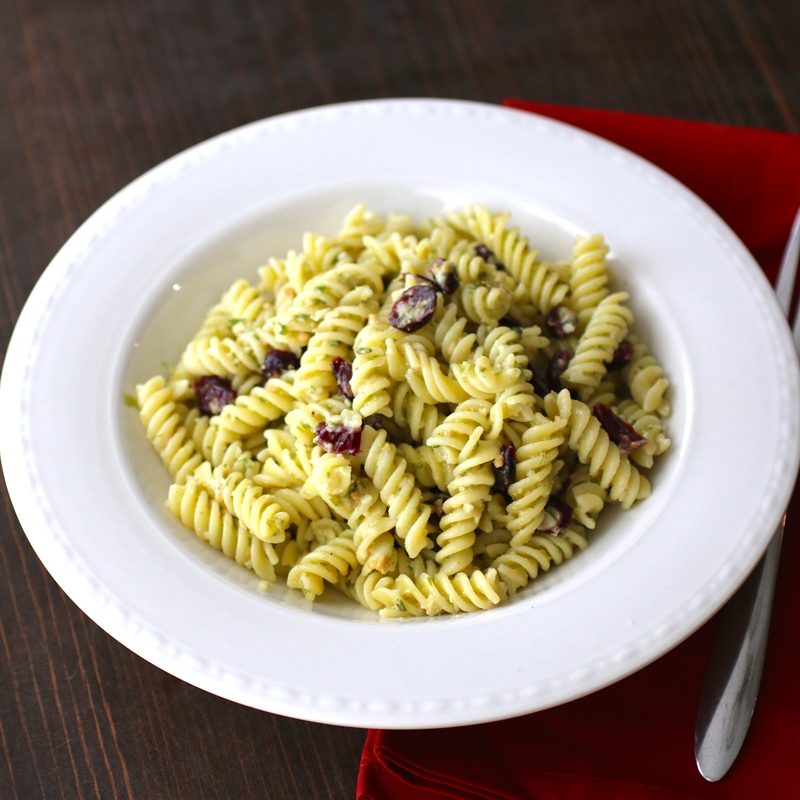 Add the cooking liquid, pasta and drained cranberries to the pesto, then stir to combine.